The first leg work I got was a band wrapping around my left ankle. Then after looking through Modern Primatives way too many times I decided to get the lizard but I wanted it a little different. 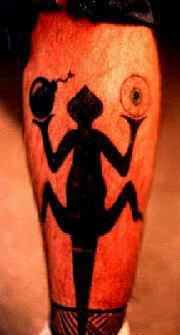 So I changed what the lizard was holding to an eyeball and bomb. I guess to me it's kind of like a balance between insight and destruction. The scar or blank line toward the bottom is from the last Have Nots show. A piece of Paul's flying V guitar flew at my leg and cut it open. They were both done by Birdman back in 95. 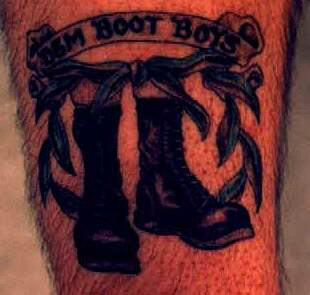 Just above the Boots tattoo is my punk tattoo. For those in the know, you'll recognize it as the Circle Jerks Logo. 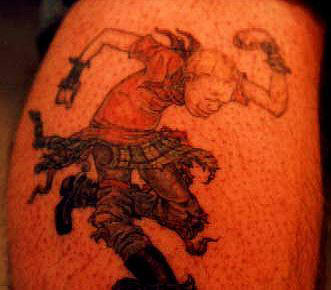 To me it really represents the main punk movement I was in during the mid to late 80s. Also it looks really cool. To think I've been into punk since 84 seems like more of a comment than any other interest I've ever had. I really need a sign to express that. Both were done in the fall of 98 by Sherry Sears at Creative Images. 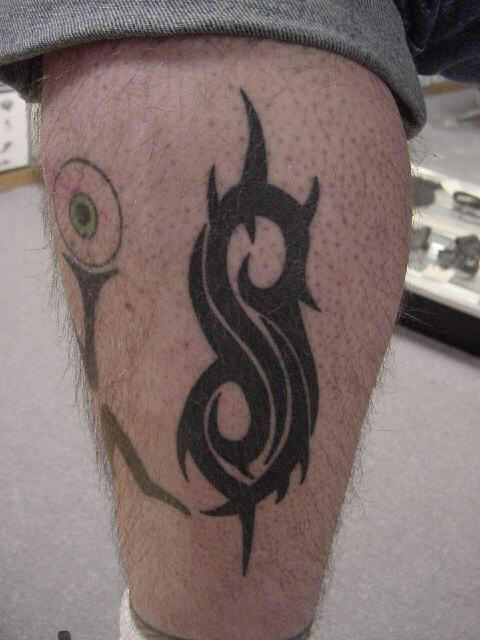 The last work I had done on my leg is of course Slipknots Tribal S. I had a bet with Paul that if their record went gold I would get the tattoo. Well the record went gold. The tattoo is by Jake Lowe of the Skin Kitchen. Shawn filmed it for some video they were doing but it didn't make it for one reason or another. He kept wanting me to go on about how much I hated the band or something. Hello my name is Davo (Dave-o) and I own and operate the Axiom in Des Moines, Iowa. We specialize in Body piercing which I have been doing professionally since May of 1994.